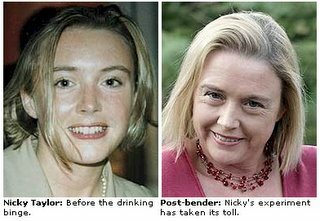 Nicky Taylor drank for 30 days straight, and went from hot to not. Unbelievable. She's doing a documentary on the effects of alcohol consumption. Makes me not want to drink. I'm ugly enough as it is! Doctors say her youthful looks will return as soon as the dehydrating effects of alcohol wear off. I have my doubts about that. She just looks OLD. If being hydrated made you look young again, there would be people ODing on water everyday.